Tuin may not be a name you recognise, but when it comes to log cabins they are one of the best, not just in the UK, but the whole of Europe. 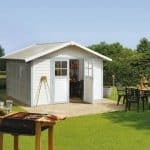 In this Tuin Review today here at WhatShed, we are taking a closer look at Tuin to see what fantastic garden buildings and extras they have to offer as well as what the overall experience of using them is like. Tuin is actually a company that is based out of Holland and their full name is actually Tuindeco. Tuin is the name of their UK based operation that handles all of the importing and selling of their products. As far as we can tell and from what they say on their website, no other garden building merchant offers the products that Tuin do. They have a clear focus on being as customer orientated as possible. Seeing a merchant that is about making customers happy is always a good thing to see. We went into this Tuin review knowing that Tuin is very proud of the log cabins that they produce and sell so, to be honest with you we thought that was going to be what they were all about, boy were we wrong! Tuin stock pretty much everything you would want a garden building merchant to stock. 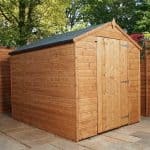 Sheds, summerhouses, gazebos and even more not so common things like fencing, decking, and garden furniture. But they do not stop there as carports, saunas and garden offices are also on offer. We were very impressed with the number of different categories they have on their site. But as log cabins are what they are most proud of that was what we took a close look at first. They currently have over 200 different log cabins and what really impressed us about this is that they have something for everyone. They have some smaller ones like the Argo Log Cabin 2x2m which is well under a thousand pounds, but also very compact, almost shed like. But then at the other end of the spectrum, they have these huge log cabins such as the William Log Cabin 8.50 x 5.90m which costs nearly 9 thousand pounds. If you think this is the most high end and expensive log cabin they offer, think again as they have some that are nearly as big as a house and have a price tag to match! We must say seeing log cabins like this for sale and in the UK is very impressive. While log cabins are clearly the main focus we took a look at the other products that Tuin offer. Like their log cabins, high quality seems to be the focus for their other products. For example when you look at their metal sheds, while they do not have a large selection of them. Tuin has made an effort to have one at each end of the size and pricing spectrum. It seems for categories like this, they have decided to go for quality over quantity and we think that is fine. 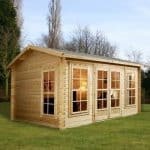 As far as regular sheds go, you are not going to find a budget priced 6 x 4 overlap apex shed on here for £150. It is simply not that kind of site, we are not saying this as a negative though. But after having a good look through the log cabins, summerhouses, sheds and even playhouses. Tuin clearly have an eye on the quality of the products that they offer consumers so if you want something cheap and cheerful, you might be in the wrong place. One other thing we want to mention about the products that Tuin offer is the extras. Let’s take another look at log cabins, it is not just the log cabins that they offer, but a ton of extras ranging from lean to’s all the way to a full on annex! 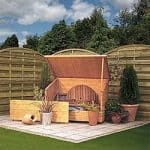 Decking, fencing and other things to improve your garden like gazebos are all interesting to look at and for the person that wants something that little more high quality and long lasting in their garden, that is the kind of products you are going to find here. 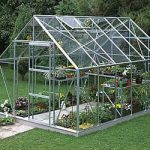 We did touch on this a little before in the review of Tuin, but the prices are, we do not want to say high as when we took a look at the products, each one we looked at was of a higher quality than what many other garden building retailers offer. Log cabins are something they take a lot of pride in so do not expect to find one for just a couple hundred pounds. While they do have some that we consider to be fantastic value for money as they like to use nice think cladding or the walls. You are going to have to spend more money that you may want to, but when you really think about it. Having cladding that is as much as 70 mm thick, makes your log cabin as strong and long lasting as a house so the prices they are asking are more than fair in our opinion. We just understand that the kind of products they stock may be a little out of reach for the person who is on a tighter budget. When you look at their other products though, you do see that there are some items that are more affordable for the garden enthusiast who is a little more thrifty. 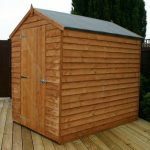 For example, we took a close look at their Metal Shed Pent – 1.82 x 1.07m which is priced at £270 and for a metal 4 x 4 shed, we feel this asking price is more than fair. We also took a look at their prices for other items like gazebos for example. You can spend under £200 if you want something more modest or you can spend over a thousand pounds if you want something more flashy and high end. Speaking of gazebos, we have to mention that even if you do buy a cheaper one, you can make it your own thanks to the budget priced accessories they have such as a see through wall or even some seating. In general, you may at first think that everything on here is super expensive. But there are some amazing deals to be had here and before you pass something off as just expensive or even worse overpriced (which we assure you it is not) look at what the product is made of and you will see why the asking price is what it is. Here at WhatShed, we know how frustrating it can be to have a site that is a nightmare to use. That is why when we do our merchant reviews, we like to give the actual site a good workout. When you get to the Tuin homepage the interesting thing you see is that the top of the page tabs is not their products, but information about the company, delivery information, reviews and so on. We are scratching our heads thinking if any other site has actually done this. We are not saying that it is bad, it is just different. The product tabs for things like log cabins, metal sheds, playhouses and so on are all located down the left side. Some of these when you click them furniture, for example, will give you further options right there and then whereas others, log cabins, for example, will give you more options once you actually click the tab. The homepage also features best sellers, deals and even products that are on clearance and about to be discontinued, let us tell you if you want a bargain, this is where you will find it. At first glance, the homepage does look really busy, but it is nice and clear and we do not think anyone will have any trouble getting to what they want. So the homepage and the way they have organized their products are good, but what about when you see a log cabin, shed or whatever that you like? Let us take a closer look at their Lianne Modern Log Cabin 3x2m to see what using the site to actually look at a product is like. Right at the top of the product page, they give you all the main information. We are talking wall thickness, estimated delivery time, how big it is and so on. Here you will also find the images of the product, each one we clicked had at least a couple of images showing it off. Scroll down a little and you get the meat and potatoes of their product, you get a description of what makes it great and there is more tabs you can click for things like reviews, related products and accessories other customers bought. We really like the way they describe and show off their products and also they even have links to other products on each page, but this is done in quite a discreet way which is nice. Best of all is that Tuin tries to help educate customers by letting them know what they need to do in order to take care of a certain product. If we had to nitpick a little bit, we would say that some of the log cabins they have could pass as a shed, so maybe they could have a separate category for those? We also like to see how easy it is to get in touch with a merchant. They have their contact information on the site and it is easy to find. You can give them a call and they are open from 9 to 5. They do have a standard email address, but they also have an out of hours email address which you can use in case of an emergency and we can probably count on one hand and have a few fingers left over for how many other sites we have seen have this. From what we could see and we had a really good look, they do not seem to have a virtual agent that you can chat with, but the other ways of getting in touch with them to make up for it. In total, we had to have clicked on over 100 different products on the Tuin website and we would have an educated guess that 90 percent of the ones we looked at had at least one customer review. The customer reviews are very easy to find as they are located with all the detailed information on a product. You just click the customer review tab and there they all are. You can just scroll down and read each review or you can click on a certain star to read all the 5,4,3 and so on reviews. Speaking of which while most of the reviews we came across were incredibly positive. We did notice the odd 2 or 3 star review that shows to us that the folks at Tuin are very honest and allow customers to post their opinions. So while there is a nice amount of reviews to look at what about actually leaving a review yourself? Well when you click the review tab before you even get to the first review, it asks if you want to leave a review on the product. Well as we wanted to know as much about this process as possible, we clicked it. Adding a review appears to be very simple. You give your star rating and then leave a little review. You need to give your email address and name, but that is to be expected. One really cool thing that the people at Tuin have done, which we are surprised more garden building retailers do not do is offer an incentive for a customer to write a review. If you have actually bought one of their products and take the time to leave a review they will send you a free gift. From what we can tell they change what the free gift is from time to time, but as of us checking them out they are offering a free LED light if you write a customer review. What Are The People Saying About Tuin? It is one thing to look at the reviews that are left on the actual site. But if you want to know what a customer thinks of not just the product they bought, but the overall service from the merchant, you need to dig a little deeper. That is why when we review a merchant we always make it a point to look at some of the more popular online review sites to see what customers are saying. Always remember that a customer is always more likely to leave an angry review than a positive one as when things go well we just take it for granted and get on with our lives. But when things go bad, oh wow do we like to let people know about it. So keep that in mind when looking at reviews. Trust Pilot is the first place we went to look for Tuin reviews and to say we were blown away is a huge understatement. As of writing, there are 355 Tuin reviews on Trust Pilot. The 5 and 4 star reviews make up and incredible 97 percent of the overall reviews and only one review is for one star. This goes without saying that it is very impressive. We are having a hard time thinking of another company that has as many positive reviews as Tuin. It is not just the fact that 97 percent of the reviews are glowingly positive, but the fact it is 97 percent out of 355 reviews that makes it so impressive. Usually, with this many reviews, you will find at least 5 maybe 10 that are bad as when a merchant is dealing with this many customers, things can go unexpectedly wrong. But that really does not appear to be the case here and it certainly fills us as it should you with confidence. We know that it can be hard to trust online reviews, but we have a hard time believing that over 300 reviews could be fake! Taking to a merchant’s social media pages is a good way to not just see some more reviews. But you can also see how they interact with their customers. Of course, the Tuin Facebook Page was the first place we went. The first thing we noticed on Facebook was that there was actually some customer reviews on here, 25 to be exact and once again they were all glowing. They do showcase a lot of their products on here and while there is not a ton of comments from people. Tuin does appear to reply and have a bit of banter and back and forth with people which we like to see. Tuin does also have a Twitter, however, there is not really much in the way of interaction with customers on here, but it is still good to have a look at if you want to see the latest products. Do We Have Any Concerns? To be honest with you, no. The site is very easy to use and the amount of products they have is very impressive. While the huge amount of positive reviews on their site is great to see, we get that some people may be less than trusting of these. But you then have to look at all those Trust Pilot reviews and ask yourself if you think they really could have that many less than honest reviews online? We think that the people at Tuin are doing a great job and found the site a pleasure to use. We liked looking at the products and we must say that we found the product descriptions as well as the little guides they have genuinely interesting so they are certainly doing all the right things. While not a deal breaker or even a big deal, we do feel that if they could have some kind of virtual agent that could answer questions right there and then on their site, that would make them even better. But with a phone number and a Facebook account you can message them on it is not an essential improvement. Tuin is doing a great job, so great that we are having a hard time thinking of anything exceedingly negative to say about them. We love how dedicated they are to log cabins and if a log cabin is what you are after then we really have a hard time suggesting you look elsewhere, especially if it is a more high end one you are after. We liked how they had plenty of more random products that you do not find on other garden building merchant sites and the way the site was laid out made getting around it nice and easy. If you want something a little more high quality and have the budget to pull it off, having a look at what Tuin have to offer is something that we highly recommend. We spent a lot of time on the Tuin site and as you can see, we thought that it was fantastic. While we get that the products may appear to be a bit pricey, we think that there is still great value for money here. 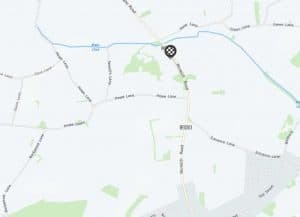 However, while we have shared our opinion on Tuin with you, we would love to hear what you have to say about them, especially if you have dealt with them as a customer. Ordered a log cabin, two days later our order was cancelled and Tuin demanded an additional 50% to fulfill the order. When we challenged this they first said it was a website issue then offered a lot of other excuses, offering us a pathetic 5% discount. Don’t trust this company.